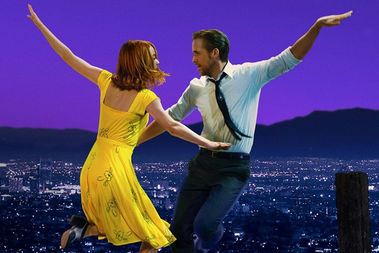 2017 Academy Award Best Picture nominee "La La Land" will be shown July 18 in Millennium Park. LINCOLN SQUARE — You might have heard there's a little event called the Air & Water Show happening Saturday and Sunday. If screaming jets aren't your thing, there's still plenty of weekend fun to be had in and around Lincoln Square. • After a week's hiatus, Food Truck Friday is back. The Happy Lobster Truck and Little Lulu's Italian Ice will be parked 4-7 p.m. at 3621 W. Bryn Mawr Ave.
• Ravenswood Manor Park's summer concert series closes out the year with a performance by Strung Out at 7 p.m. Friday at the park, 4626 N. Manor Ave.
• Catch a free screening of "La La Land" under the stars at 7:30 p.m. Friday at Independence Park, 3945 N. Springfield Ave. The movie is rated PG-13 and has a running time slightly over two hours. • Get a double dose of Shakespeare at a pair of outdoor performances. "Midsummer Mayhem: The Very Witching Hour" runs at 7 p. m. Friday-Sunday in Winnemac Park, 100 N. Leavitt St. At 6 p.m. Saturday and 2 p.m. Sunday, Midsommer Flight presents "Hamlet" in Gross Park, 2708 W. Lawrence Ave.
• Make a dinner reservation at Artango Bar and Steakhouse, 4767 N. Lincoln Ave., and enjoy a free flamenco performance on the side from 8-9 p.m. Saturday. • Theatre Hikes brings its unique brand of participatory theater back to Horner Park at 11 a.m. Saturday. Meet at the corner of Montrose and California and prepare to "hike" to different "sets" around the park during the troupe's production of "The Complete History of America (Abridged)." Admission is free but donations are appreciated. • Join a leisurely six-mile community bike ride through Albany Park and Irving Park from 10 a.m.-2 p.m. Sunday, hosted by the 33rd Ward Transportation Action Committee. The ride starts and finishes in Horner Park, 2741 W. Montrose Ave., and will make a stop in between at Miko's Italian Ice. • Tano's Pizzeria is throwing itself a fifth anniversary party with free appetizers, soft drinks, DJ, face painting and raffle prizes including the chance to win free pizza for a year. The celebration is set for 1-5 p.m. Sunday, 3038 W. Irving Park Road. In case you missed our previous coverage: 20 Percent Theatre Company is producing its annual Snapshots 10-Minute Play Festival Wednesday through Sunday at North Center's Cornservatory, and Winnemac Park is prettier than a postcard at the moment (if you visit, think twice before hanging a hammock).